This is part 3 of a four-part article. Many images sets have a time dimension. For instance, we know a year and a month for most of van Gogh's paintings; for manga titles, we know the position of each page in the title sequence. How can we see study temporal patterns across a sequences which may contain thousands of images? We can map images positions in a sequence mapped into X-axis, and one of their visual features into Y-axis. If we use points and/or lines to represent each image, the result is a familiar line graph. 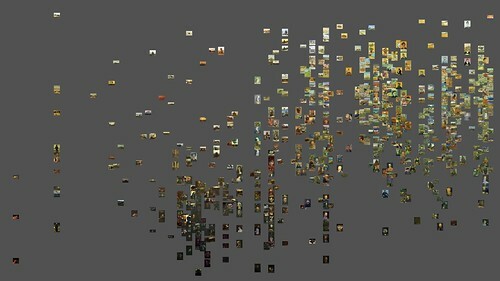 Here is an example: We place 776 images of Vincent van Gogh paintings (1881-1890) horizontally according to their dates (a year and a month a painting was created). Brightness median values of the images determined their vertical positions. 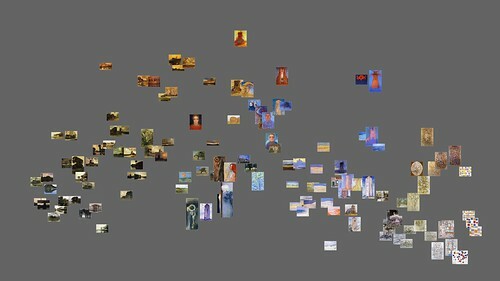 Lets use this technique to compare temporal changes in saturation in sets of Mondrian and Rothko paintings. data: 128 images of Piet Mondrian's paintings (1905-1917). 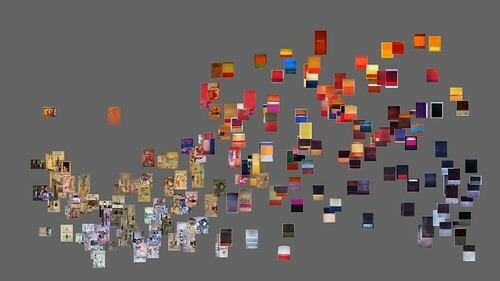 X-axis = a year and month a particular painting was created. data: 205 images Mark Rothko paintings (1934 - 1970). X-axis = a year a particular painting was created. When we are dealing with sequential art such as comics and manga, we don't have this problem: we can place images on X-axis according to their exact position in a narrative, like in the following example. data: all pages of a webcomic Freakangeles published on the web over a year and an a half period (Feb 15, 2008 - June 6, 2009). Each week, one episode consisting from siz pages was released (57 episodes; 342 pages). X-axis: pages are placed according to their publication sequence, left to right. Like print comics and manga, web comics may run for years with new episodes added daily, weekly, or monthly. How does their visual style change over the duration of publication? Are the temporal patterns gradual or abrupt? How do these patterns relate to development of a narrative? Despite the weekly intervals that separate the episodes of Freakangels, our visualization shows that its visual form is remarkably consistent. For the larger part of the publication period, the changes in brightness (the same applies to hue and saturation) follow a smooth curve. Visualization reveals this unexpected pattern and allows us to see the exact shape of the curve. The visualization examples in the previous section shows changes in values of a single visual feature (for example, average brigtness or average saturation) over time. Can we visualize evolution of an image sequence along two dimensions (i.e., two features)? Lets look again at our earlier "style space" visualizations. They are 2D scatter plot with (optionally) images rendered on top of the points. The visual features of images analyzed automatically with digital image processing software become X and Y coordinates of the points. 127 paintings by Piet Mondrian created between 1905 and 1917. Left plot: each image is visualized as a point. Rigt plot: the images are rendered on top of the points. For example, to see how Mondrian and Rothko moved through brightness/saturation space during the periods we are comparing, we can visualize each painting as a color circle and vary hue in accordance to dates. Our Mondrian set covers cover the period from 1905 to 1917. We will use pure blue (R=0, G=0, B=255) for 1905 paintings and pure red (R=255, G-0, B-0) for 1917 paintings; all others will take on in-between color values. (The art historical sources only give a range for some of the paintings: for example, the dates for Still Life with Gingerpot II given by Guggenheim Museum NYC which owenes this painting are 1911–12. In these cases, we used an intermediate values, i.e. 1911.5 to set points hue in the graphs). Our Rothko subset which we used before for comparison with Mondrian runs from 1938 to 1953. 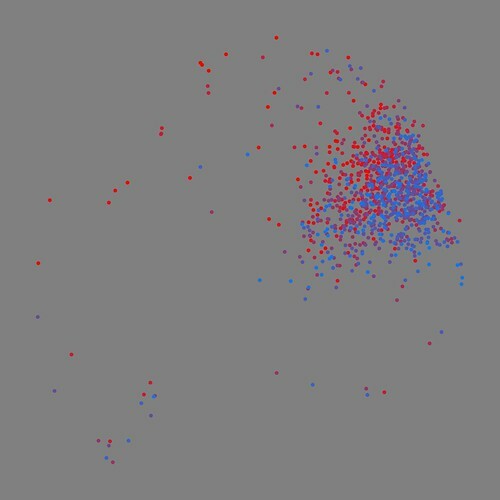 Here, pure blue points will represent 1938 images, and pure red will represent 1953 images. To make patterns even easier to see, we will also vary the size of the points. Smallest circle represents the first year, and largest circle represents the last year. First visualization shows images, the second uses color points. X-axis min = 0; X-axis max = 250. Y-axis min = 0; Y-axis max = 250. We can also apply this technique to sequential art scuh as comics and manga. For instance, lets visualize "Tetsuwan Girl" manga title by Takahashi Tsutomu (1094 pages). First, we will plot all pages as images. We will use the same features as in our earlier visualization of the complete set of one million manga pages: standard deviation (X-axis) and entropy (Y-axis). These features allow us to capture an important stylistic dimension. The pages that are more graphic, have high contrast, little detail, and no texture end up in the upper right of the visualization; the pages which are visually opposite (significant amounts of texture and detail, more gray tones) end up in the lower part; all intermediate pages position between these two extremes. "Tetsuwan Girl" manga by Takahashi Tsutomu (1094 pages). 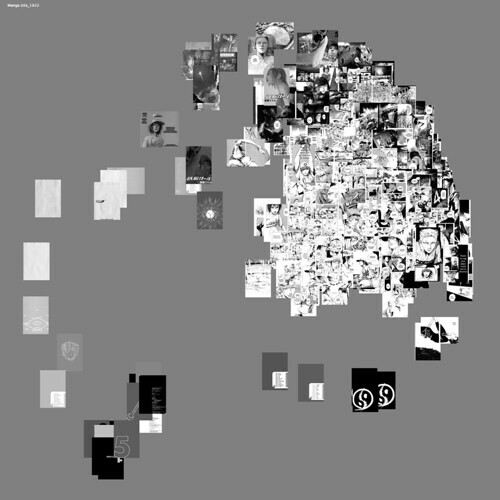 Both features are calculated over grayscale values of all pixels in each page. Now, lets visualize the same data as points and vary their hue. As we did with Mondrian and Rothko, we will use blue-red gradient to represent time - specifically, the position of a page within the title sequence. less texture and detail than the pages in the second. We can also see many violet points which are vertically in between the blue and the red clusters. This indicates that the transition between the two types is gradual. compare the patterns of graphical change in all the titles? 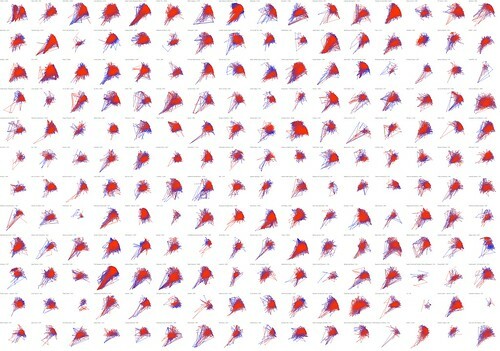 Borrowing from the standard visualization technique called "scatter plot matrix" and also Edward Tufte's concept of small multiples, we can visualize each title using the same features for X-axis and Y-axis, and organize all visualizations in a grid. (It is important to use the same ranges for range for X-aixs and Y-axis in each graph, so they all have the same scale.) 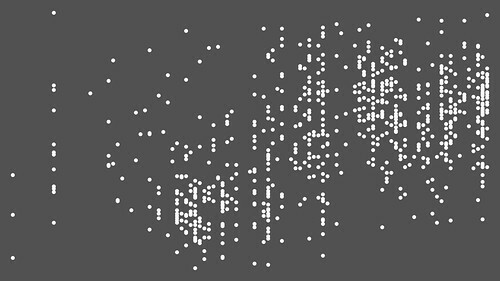 To use the analogy with a "scatter plot matrix," we will call such a visualization a "style space matrix." Y-axis = entropy; pure blue = first page; pure red = last page). The name of a title and the number of pages appear in the upper right corner of its plot. The mapping of pages positions into color values creates distinct and easy to read visual patterns. They indicate whether a style in a given title changes over the period of its publication. You can quickly scan the style space matrix to see which titles have unusual patters and should be investigated more closely. You can also divide titles into different groups depending on their graphical development in time: no or very little development, gradual change over time, significant and fast changes, and so on.